The Pisani men dreamt of being professional athletes — dad, Al, wanted to play infield for the Pittsburgh Pirates, and son, Alex, sought to be some type of athlete who got to travel and compete. Neither one plays sports professionally these days, but they’re still in the same field — of work, that is. Today, Al Pisani is the senior vice president of corporate development at Serco Inc. His background “centers upon applying analytical thinking and techniques to optimize resource allocations and decision making,” he said in an interview with WashingtonExec, a position that is a long way from his first job as a caddy at a local golf club. Son Alex Pisani’s career is similar. He started as an employee of Hoop Magic Basketball Academy in Chantilly, Va. “I worked the gamut from front desk and food services to putting on birthday parties for kids,” Alex said. Today, he is a research associate at Dinte Executive Search in Tysons Corner. “I conduct research and develop reports on candidates for high level searches for clients within the defense industry,” Alex said. 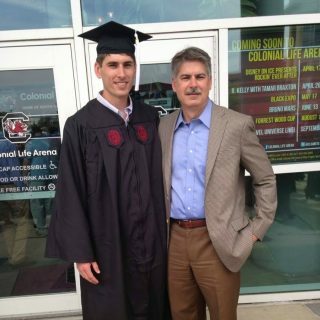 Alex said he never saw himself entering the govcon industry like his father, but now that he’s a part of it, he is recognized as his father’s son. He said the example his parents set provided him with a blueprint for success. “My parents always encouraged me to engage myself in whatever work or schooling I was undertaking. Having integrity was always a major characteristic that they lived by and practiced, so that has stuck with me. I consider that to be most important because I strive for consistency in my career and my life, so I figured that going about my life in the same way as I’ve watched my parents would ultimately lead me to where I want to be. Look ahead, both hope to have positive impacts on their communities.